>Customer Case:ALPINE INFORMATION SYSTEM, INC. Successfully established a 2tier-ERP that links sales offices in Thailand with the head office in Japan, thus reinforcing regional strength in the Asian region. ALPINE INFORMATION SYSTEM, INC. (hereafter AISI) manages the IT of the Alpine Group of companies; a recognized name in the field of car navigation systems and audio equipment. It develops and installs their IT infrastructure, as well as operates and offer maintenance. With aims such as to grasp real-time business situations at its various sites across Asia Pacific region, it installed Microsoft Dynamics AX, a comprehensive ERP package, at its Thailand office where they oversee the whole of Alpine's Asia Pacific operation. Here are more specifics on the AX installation at Alpine Group who are fortifying its base in Asia to support the Group's unceasing corporate growth. The various data regarding the overseas local operation were managed not inter-organizationally but by the individuals-in-charge. This was making the monthly tallying process considerably tedious and time-consuming, and there were issues in the accuracy of analysis results. Having integrated the data necessary for management decisions into one system, shifts in various figures can be viewed at real-time, enabling accelerated corporate management. Also, data analysis accuracy also has improved. "Product coding to keep control of items and coding system for analysis were not unified with those of the head office therefore rendering tedious manual adjustments to match the head office coding every time we needed to tally up the figures." Integrating the coding system throughout the company made it possible to make analysis of the data stored in the system on the same axle as that of the head office and has alleviated the workload of the overseas sites as well. Data access control was insufficient, disabling data viewing, editing and approval by the person of correct authority by job rank or job territory. The system enabled the setting of access jurisdiction according to the user's authority. This authority allocation can also be visually confirmed by the head office as well as at the overseas sites. Alpine aims to become 'a Mobile Media Innovation Company that 'provides an enjoyable car lifestyle'. Their operation spreads across 17 countries with over 50 sites worldwide providing products to automobile manufacturers and to the general retail market. AISI's mission is to deploy IT to its fullest to support the business foundation of the ever-growing Alpine Group, and to elevate the Group's corporate value. Yosuke Miyasaka explains that "We installed Microsoft Dynamics AX at our sales office in Thailand because Thailand oversees the whole of our Asia Pacific operation. The system Thailand was using before was only limited to specific range of business tasks, and the various financial data they've been sending us at every end of the month had to be re-processed here at the head office. However, since information were not aligned inter-organizationally, the data themselves were individualistic, making the monthly tallying process considerably tedious and time-consuming. In turn, when overseas sites wanted to have certain financial data from the head office, we had to tally together the necessary data to fit their request, which were also tedious, especially in that the overseas sites and head office were using totally different codes that had no link whatsoever with one another." "We've spent about 10 years installing large-scale ERP as our core system worldwide and had completed installments in all our major sites. However, when the time came to install the system to newly emerging countries, we found that large-scale systems just did not meet the local business situations. That was when we came across Microsoft Dynamics AX; the system that fits in with the emerging countries' business sizes, that supports multiple languages, and that comes as an ERP package!" says Shinji Maeda, President of AISI. Yosuke Miyasaka adds,"When installing ERP in the Asia Pacific sites, we focused on the points that we didn't have a huge budget for ERP as they were still in the emerging stages and secondly, that it had to be a system that can be installed in a short time. Microsoft Dynamics AX appealed to us because it was easily installable in small/mid-sized companies and its usability was simple and intuitive. As it was to be a 2tier-ERP, an architecture with 2 layered system that would allow head office in Japan to keep its existing ERP while Thailand implemented Microsoft Dynamics AX, the integration between the two systems was another major concern. In this sense, Microsoft Dynamics AX had no issue integrating with other companies' ERP and as it is equipped with production management functions, we are confident that it will exhibit its potency as an integrated system when we deploy it to other production bases going forward. We're considering installing the system in various emerging countries so the fact that Hitachi Solutions offer support worldwide was another factor that led us to select them." "We gained enough knowledge of the existing local systems and business processes to discern what fitted in with the package (system) and what didn't. Then, together with Hitachi Solutions, we worked on Microsoft Dynamics AX's design and specifications to enable best results and repeatedly tested prototypes at the actual local environment. Since matching the local business practices and meeting the local rules and regulations were mandatory, those that couldn't be fulfilled with the package had to be customized. This was easily capable with Dynamics AX. Also, when it was inevitable to customize the package to meet our business processes, Hitachi Solutions was very helpful in doing the development. This project was to be a 'model case' of ERP implementation in emerging countries so we asked Hitachi Solutions for expertise on the system itself as well as to give us guidance on the best project procedure. Even then, Hitachi Solutions proved to be incredibly reliable, offering us materials that described procedures, giving precise answers to our questions on setting up parameters and responding without fail to all other of our needs," says Yosuke Miyasaka. Shinji Maeda goes on to say that,"The effect the Alpine Group counts on through installing the system is to get a visible grasp of the business situation whenever necessary. Business environments in emerging countries go through rapid changes necessitating us to be quick to keep pace. The companies themselves haven't yet a long history so in addition to improving managerial visibility, we are hoping to forge ahead to improve their business processes. Before, we couldn't see the accurate monthly performance figures until the end-of-the-month tallying process was completed. However, now, we can see each numerical shift in almost real time making it possible for us to take measures immediately. The burden and time it took for the local sites to tally the monthly figures has also dramatically decreased. Until now, there were considerable lapse of time until a head office division received response from overseas sites since the responder needed to search for the particular data that was requested. After the system was installed, it became possible for us to act as a window between the head office and overseas to respond to such requests, improving the speed of communication between the concerned parties. Simultaneous to the system installation, codes to the products we offer were commonized enterprise-wise. Until now, overseas had their own locally unique code and analyzing design that rendered manual adjustments and other tedious tasks. Now, we can use the same product codes for analysis. The system enables us to set access jurisdiction according to the user's authority. This authority allocation can also be confirmed by the head office. Until now, individuals were tallying and analyzing data in their separate ways. It was these information that were personally managed, that was making it difficult to contrive data consistency and that was hindering accuracy of analysis reporting. However, with the new system, tally and analysis are done based on centralized data, improving analysis accuracy dramatically." He also adds,"Microsoft Dynamics AX's usability is intuitive and simple to understand. Users only need to use it once to understand it so there is no need to schedule any special operation training sessions." "In the spring of 2014, we announced a corporate-wide management vision heading for the year 2020, called 'Alpine Vision 2020'. The automotive industry that we belong in, will change greatly in the coming years. Amidst this, it is integral for us to grasp well in advance, the changes that'll be occurring in the overseas business environment where the majority of our sales are, and deploy our business accordingly. We count on Microsoft Dynamics AX to become the bedrock to elevate our global competitiveness by contributing in accelerating management decisions and reorganizing our global business processes with its capability to centralize management information and improve 'visibility' of operations worldwide. I feel that Hitachi Solutions was most resourceful and quick when implementing the system. We're hoping to utilize Thai installation as a template and deploy the system to India, the Middle East and other new sites so we look onto support from Hitachi Solutions in the future as well," says President Maeda. "Going forward", says Yosuke Miyasaka,"we'd like to work on adding on functions that we had to shelve this time around due to scheduling and other reasons. One such function is the 'order portal' that would enable entries of orders received at Thailand's agents and other Alpine offices even outside of Thailand. Since our Asia Pacific trading covers a huge area, speed is one of the critical factor. The acceleration of operation management and system implementation will continue to be pursued and we hope to proceed support to streamline local operations overseas. We hope that Hitachi Solutions will continue to optimize the strength of its worldwide presence and continue to advise us well." 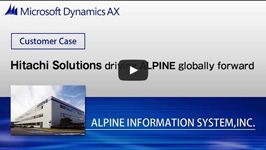 Please see our Microsoft Dynamics AX Success Story with ALPINE INFORMATION SYSTEM, INC.! This is a video of the "Microsoft Dynamics AX construction service" Customer Case. I watched the process that led to the introduction of the Microsoft Dynamics AX system in an Alpine Information System,Inc.